This holiday home was superbly renovated in 2005 and the beautiful furnishings are immaculately maintained. The spacious kitchen-diner is fitted with all conveniences while retaining authentic details. The pleasant furnished patio with BBQ is accessed through the casement doors and is perfect for those who enjoy the outdoors. The holiday home is quietly situated and its thick stone walls, slate roof and wooden beams are a pleasure to the eyes. And all of it is original! For the children there is a play-set and the private swimming pool can be covered, so you can swim laps or just relax in it in all weathers. The spacious garden with its typical Spanish chestnut trees are a fine picture and make a contribution to the already beautiful French landscape. Restaurants, tennis court, bakery and daily shopping can all be found in nearby Campsegret (1.5 km). 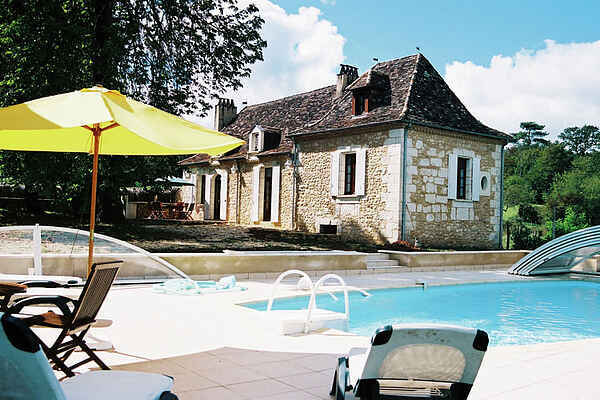 Make a visit to Bergerac (12 km) on the Dordogne river. Apart from shops, outdoor cafés and museums, this town also features superb parks, and canoes and bikes are available for hire there. Feel like a day out visiting castles? We recommend Lanquais, Bannes, Bridoire and the famous Monbazillac (all within 25 km). Swimming lake with sandy beach at Vergt (17 km); 18-holes golf course at Tuilières (15 km). And there is a big supermarket in Creys (13 km).